Tea has existed as a beverage since 2000 B.C. The brewing, serving, and drinking of tea are time-honored rituals throughout the world. While there is general agreement that the tea trade began in China, both China and India lay claim to discovering the dietary properties of tea leaves. The Chinese tell the story of a mythical emperor named Shen Nung who was so particular about his nutrition that he boiled his drinking water before he drank it. One day, the story goes, the wind caught some of the leaves on the tree branches that he had used to build a fire. The leaves floated into his boiling water and, lo, tea was created. In India, the discovery is attributed to Bodhidharma, an actual person who founded the Ch-an School of Buddhism. In A.D. 527, after four years of a self-imposed nine-year meditation, Bodhidharma grew sleepy. In an attempt to stay awake, he began to chew on the twigs of a nearby tree and suddenly found himself wide awake; he had discovered tea. The tea bush is a white-flowered evergreen in the Camellia family. Chinese documents record it as indigenous to the Hunan province in southwest China. In modern times, it is generally accepted that the original tea bush grew in India and was brought to China. It thrives in a rocky terrain. In approximately A.D. 350, tea cultivation was also reported in the Szechwan province along the Yangtze River. During the T'ang Dynasty in the eighth century, tea drinking achieved the status of an art form. Tea merchants hired a man named Lu Yu to compile the first written record of Chinese tea ceremonies. Entitled Ch'a Ching (The Class of Tea), the three-volume work revolutionized the tea industry. The second volume includes an exhaustive list of the equipment necessary to brew tea correctly; all-told, 24 items are listed. In the 12th century, monks from the Zen sect of Buddhists brought the tea-brewing process home to Japan from their travels in China. Yeisei, a Buddhist abbot, is credited with writing Japan's first tea book: Kitcha-Yojoki (Book of Tea Sanitation). Since then, Zen Buddhism and tea have grown inseparable. Several Europeans mentioned bringing tea back home from their visits to the Orient. One of them was Giambattista Ramusio, an editor of travel books and a diplomatic representative of the Venetian government. Gaspar da Cruz, a Portuguese Jesuit priest and missionary, also brought tea when he returned. In 1520, Ferdinand Magellan discovered the straits that now bear his name around the southern tip of South America and opened the door to a what would become a well-traveled westward trade route between Europe and the Orient. Holland was the first to record the purchase of tea in 1607. The tea was first sold at apothecary shops, then in stores where spices and sugar were sold. By the 18th century, stores devoted entirely to the sale of tea and coffee had opened. The first tea sold to the English public occurred in 1657 at a coffee house called Exchange Alley. When King Charles HI married the Portuguese princess Catherine of Braganza in 1661, her dowry included tea. Fifty-five years later, on October 12, 1712, Thomas Twining opened England's first tea shop. although the English addiction to tea was not as detrimental as the Chinese addiction to opium, the company also profited by the sale of tea it brought back in exchange. The English government ignored the questionable nature of the company's business so that it could levy a high import tax on tea. In spite of the tariff, or perhaps because of it, a great deal of tea was smuggled into the country. The tea tax also figured prominently in the American Revolution, as witnessed by the infamous Boston Tea Party when rebellious colonists pitched a shipment of East India Company tea into the harbor. Until the early 20th century, tea was sold loose. Tea bags were invented quite by accident in 1904 when Thomas Sullivan, an enterprising merchant, wrapped samples of tea leaves in silk bags and sent them to prospective customers, some of whom dipped the bags directly into boiling water. The silk bags gave way to gauze pouches and eventually to specially treated filter paper. Herb teas, caffeine-free and cultivated from a variety of plant leaves, flowers, roots, bark, and seeds, have become enormously popular over the last 20 years. Although they were probably brewed as early as prehistoric times, herb teas were primarily consumed for medicinal purposes. bags. The top tea leaves and leaf buds are hand-picked from the plant. The leaves are then subjected to several processes including withering, rolling, drying, cutting, and blending. The intensity and duration of each process differs according to the type of tea. The filter paper is made primarily of abaca, the leafstalk of Philippine bananas also known as Manila hemp. 1 Traditional withering practices call for manually spreading the leaves in thin layers and exposing them to the open air for 18-20 hours. Modern factory methods place the leaves in troughs, perforated drums, or tunnels and expose them to mechanical blasts of hot air. This process oxidizes the polyphenols, or tannins, the primary active ingredient, and turns the tea leaves a coppery color. 2 The leaves are crushed either by hand or on rotating tables called rolling machines. Either method twists the leaves so that they are eventually coated with their own juices and torn into smaller pieces. Some companies employ high-tech machinery similar to tobacco-cutting machines to crush and tear the tea leaves. 3 Black tea leaves are mechanically dried using a high-temperature method to seal in juices and flavor. This process turns the leaves to their characteristic black color. Oolong tea leaves are rolled, dried, and rolled again. The drying time is shorter than that for black tea, therefore the fermentation is less natural and half or less of the polyphenols are oxidized. Green tea leaves are steamed within 24 hours of harvesting, using either moist or dry heat in perforated drums or hot iron pans. This process destroys enzymes and prevents fermentation and the oxidation of polyphenols. Herb tea is simply bundled together and hung upside down to air dry. 4 After the leaves are dried, they are brought to a mill room, where they are cut with a rotating blade into varying degrees of fineness, depending on the type of tea. 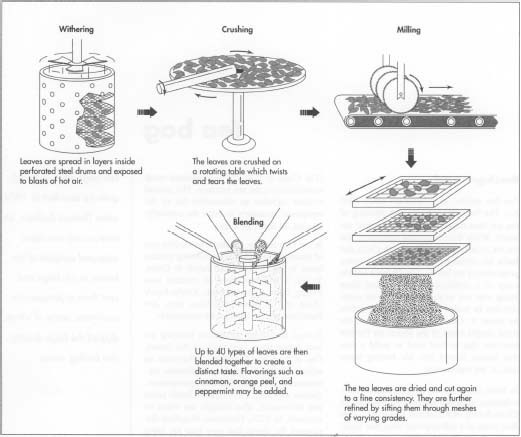 The cut leaves are further refined by sifting them through mechanical sieves with meshes of varying grades. The tea used in tea bags are typically broken-grade or smallsized teas because they require a shorter brewing time. 5 The leaves are blended according to company recipes to achieve a uniform taste and texture. Most teas are a blend of between 20-40 types of tea leaves. The blending process may also include the addition of natural flavorings such as cinnamon, orange peel, nutmeg, cloves, chocolate, licorice root, peppermint, ginger, crushed hibiscus flowers, fennel seeds, and chicory root. 6 The processed and blended tea leaves are stored in hoppers that hold up to 800 pounds (363 kg) of tea. Flow tubes connect each hopper to a doser wheel. The doser wheel resembles a Ferris wheel with small chambers in the place of seats. Air pushes the leaves through the flow tube and into the wheel which separates the tea into the chambers in pre-measured amounts, usually two grams. 7 Two large rolls of filter paper are fed over the top and underneath the doser wheel. 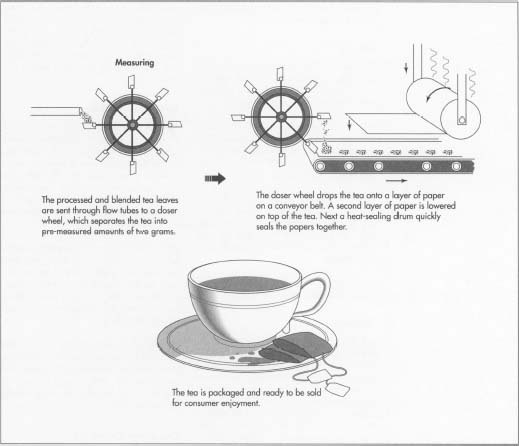 As each chamber arrives at the bottom of the doser wheel, it releases the tea onto the bottom paper layer of paper as it moves along a conveyer belt. The top layer of paper is lowered onto the lower layer so that each measure of tea is sandwiched between the two layers. 8 A conveyer belt moves the three components to a heat-sealing drum fitted with an indentation pattern. The drum quickly seals the paper along the indentation lines. The timing of this process is closely monitored because too much heat would adversely affect the tea. 9 The sealed paper continues along a conveyer belt until it reaches a perforation blade that is calibrated to cut the paper into precise squares. After a string and tag are stapled to the bag, they are dropped into pre-printed boxes. Professional tea tasters check each batch of tea before it is inserted into the filter paper. Tea tasting is an art, not unlike wine tasting. Cups of brewed tea are lined up along with bowls of the tea leaves from the same batch. Tasters slurp the tea to the back of their throats, atomizing the tea so that they can taste it and smell it at the same time. The tasters also examine the unbrewed tea leaves to check for cleanliness, purity, and freshness. The tea must also meet company standards. Each tea is blended to achieve a particular taste and appearance, therefore company recipes are strictly followed for consistency. Consistency is also maintained through computerized control systems that regulate the speed of the manufacturing machinery and heating processes. The systems alert plant workers to breakdowns and jams. In spite of coffee's popularity, tea continues to be a fashionable beverage. The Tea Council of the United States estimates that Americans alone consume 122 million cups of tea each day. Worldwide, it is the second most popular beverage, preceded only by water. Recently, the scientific community has become interested in the potential health benefits of tea, particularly in those properties that could lower blood pressure and blood cholesterol levels, stabilize blood sugar, prevent tooth decay, and inhibit the growth of cancerous tumors. Goodwin, Jason. A Time for Tea. Alfred A. Knopf, 1991. Perry, Sara. The Tea Book: A Gourmet Guide to Buying, Brewing, & Cooking. Chronicle Books, 1993. Woodward, Nancy Hyden. Teas of the World. Macmillan Publishing Company, 1980. Booe, Martin. "Tea Tempest." Chicago Tribune, January 16, 1995, Sec. 5, p. 1. Carton, Barbara. "Tea Companies Get Steamed Up About Who Invented the Wheel." The Wall Street Journal, January 12, 1995, p. B1. Charles, Dan. "A Cup of Green Tea a Day May Keep Cancer Away." New Scientist, September 14, 1991, p. 17. Evans, Mary Anne. "A Perfect Cup of Tea." Gourmet, November 1993, pp. 52, 54. Raloff, Janet. "Add Tea to That Old 'Apple a Day' Adage." Science News, October 30, 1993, p. 278.
happens when it gets MIRCO WAVED.. I use to learn so many things from this article. I am interested about establish a small tea bag manufacturing factory in my city.in my country we have lots of raw materiel and I need only packing machine.its will be great for me if i will be know about the prices of the tea bag peaking machine. I must say that i am very glad with the information given to me concerning the various processes in tea making. I would like to know the various machines and the prices formaking tea and tea bags. Thank you. I have been told that the material used in making tea bags is very harmful to our health. Is this true?